Created for you, with love. I cant believe its been nearly 6 months since I last posted. Things have been somewhat busy here, with my eldest in his GCSE year, and looking to do well, He wants to go to 6th form in september for A-levels, and then onto the RAF to do aviation engineering. He turns 16 next week, and I cant believe he is almost a grown up already. For now, onto what I have been doing recently. A foray into chain maille, and seed beads (I know, I swore I would never used seed beads), but I am, and loving them at that. Here are some of my seed beaded creations, including a tassle ring, and a cellini spiral bracelet (which i made too small and only fits my 9 year old). 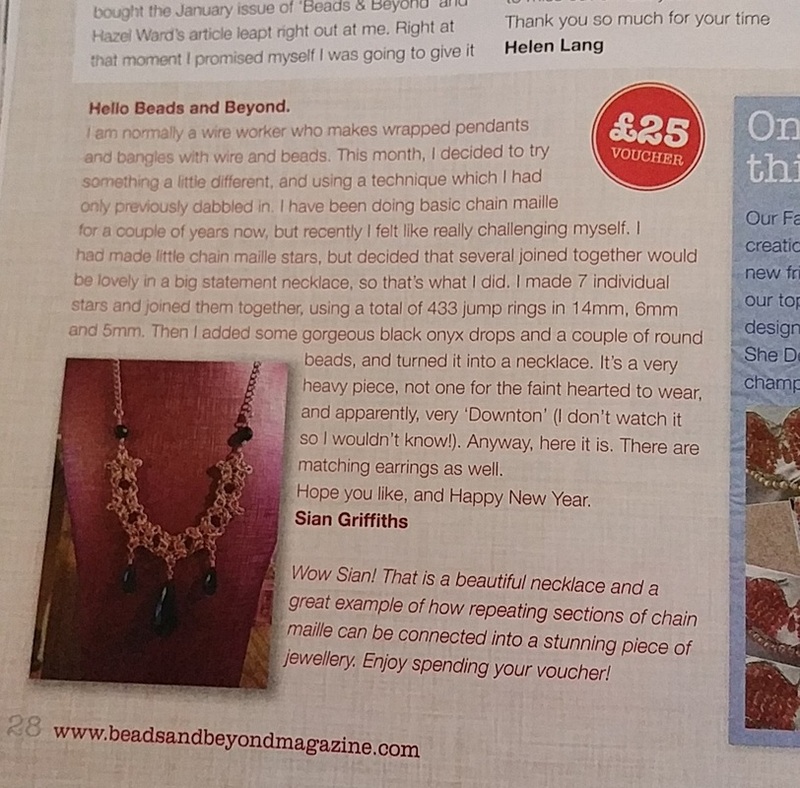 I have also had my first picture published in a magazine, my chainmaille Stars necklace, the picture of that is below. 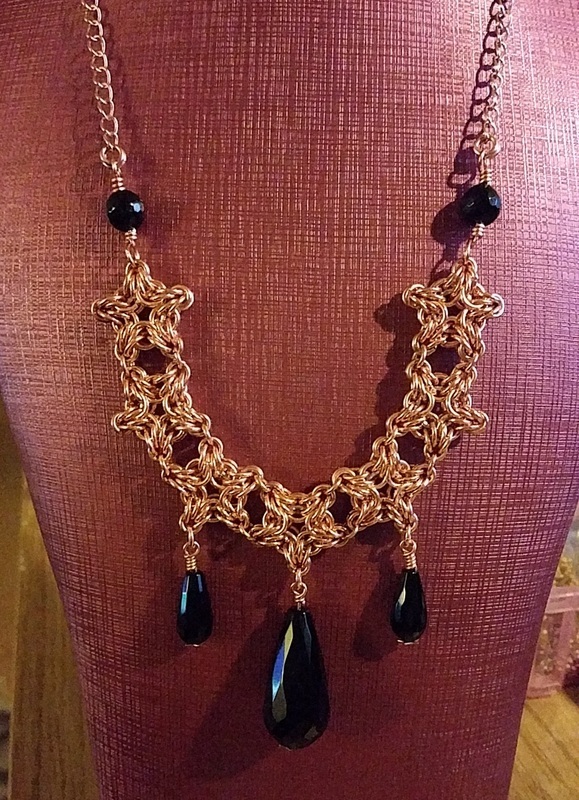 I am so pleased with how this necklace turned out (and the matching earrings) as it was the first time I had taken a design in chainmaille, and turned it into something. The original star came from a tutorial on pinterest, and I turned it into a necklace. its a large and heavy piece, so totally different from my usual style, but I think it works so well. Wow, its been forever since I last posted here. So much has happened, we have moved house (finally), the kids have gone back to school after a hectic summer, I have done another course, and am decorating my new home. And now we have begun the run up to christmas, I have a new collection coming very soon, and will be starting to do some tutorials as well. Here are some of my recent pieces, which will be on sale shortly. And here is the piece I started on the course I attended at the weekend, hosted by two fantastic ladies whom I am proud to call friends. My butterfly, made in non tarnish copper wire with Lapis Lazuli, Sodalite, Aquamarine, Pearls and Blue Quartz. 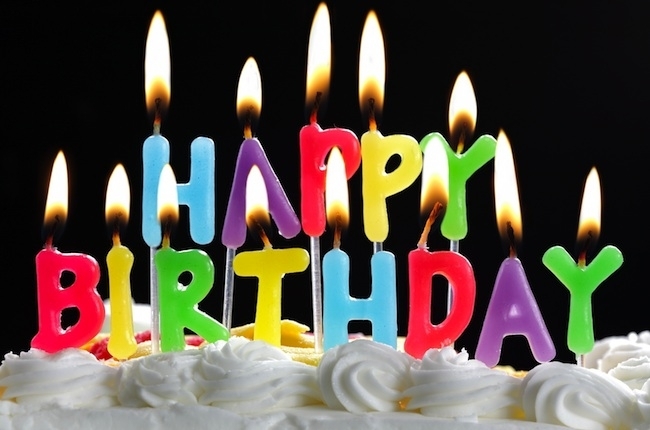 First and foremost, I have some birthday wishes to give. To my son Connor, who will finally become a teenager next week (18th june) many happy returns mate, you made it to 13 at last. And to my wonderful Mum, Julie, who celebrates her birthday on 7th July, and her 37th wedding anniversary with my Dad on 9th July, Happy birthday mum, you remain an inspiration and a tower of strength to me xxxxxxxx. 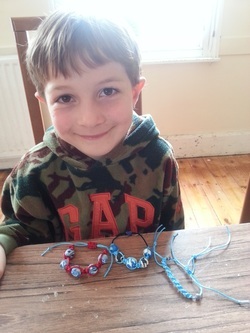 This is the very cute (and very clever) Henry with his wonderful macrame creations. I have also been experimenting with different mediums in my work (again) and here are a few examples of items I have made, with sari silk, friendly plastic and other items. Mixed media here with friendly plastic, sari silk and wire. 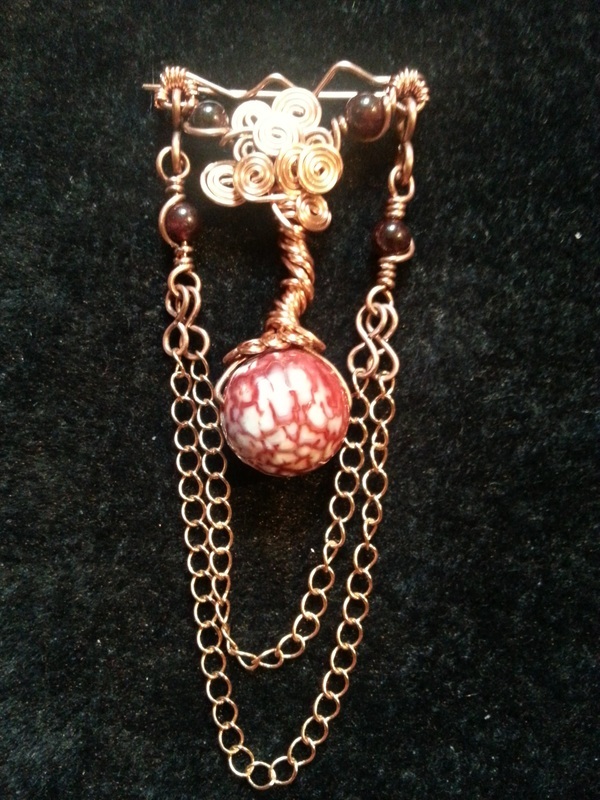 and the back to see the pretty clasp. 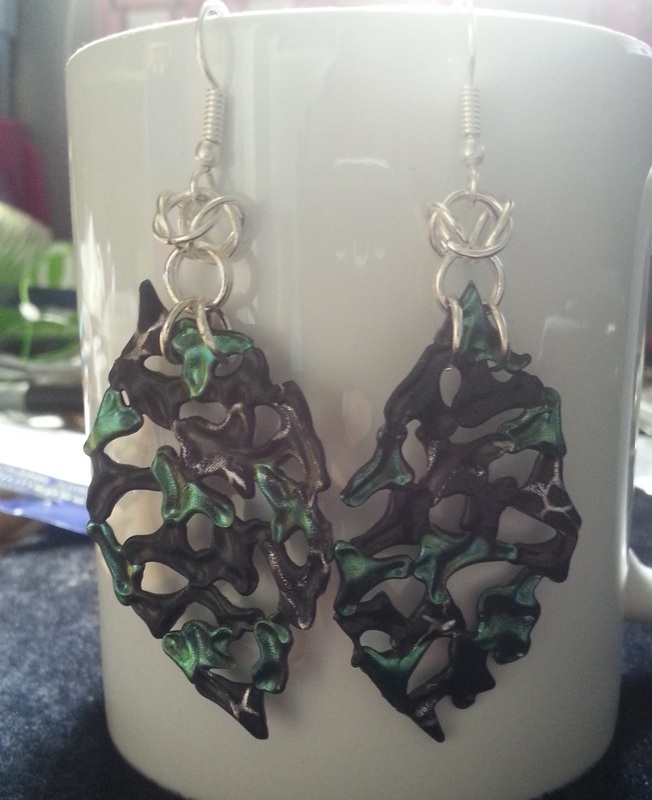 Friendly plastic and chain maille earrings. Wow, I can't believe its over a month since my last post. I have been so busy, I just haven't had time. Let's see, two of the kids have had school residentials, the easter holidays have happened, I have run a kids crafting workshop with a friend (took a lot of organising, but more on that shortly), and I have started working with a totally new (to me) medium for jewellery. So, first things first, the crafting workshop. 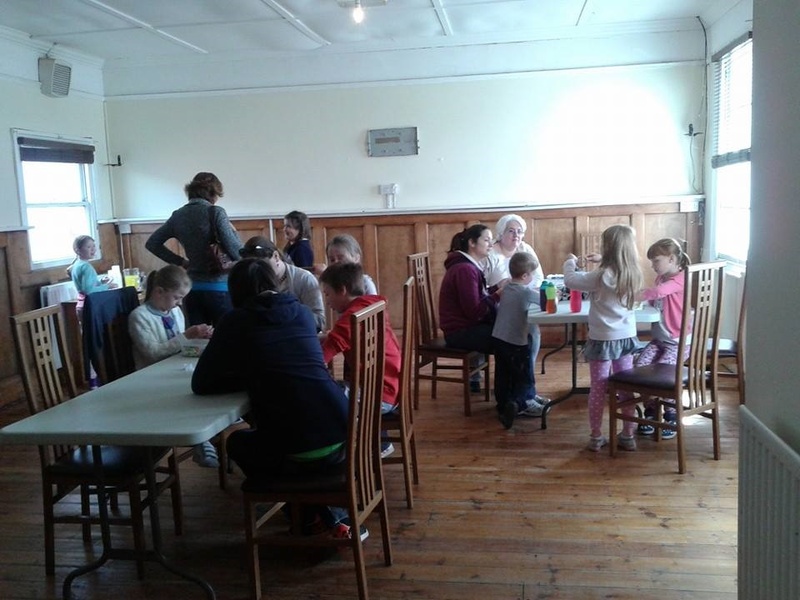 I teamed up with my good friend Fiona Jones, of Sunago Unique Creations which is also based in Cheltenham, to run a holiday crafting workshop for local children. The Fairview pub on Hewlett Road, generously gave us a lovely room in which to hold the workshop, and it went well. It will be repeated in the future. The lovely Gessica, showing off her makes from our workshop. Next, I have been working with a new (to me) medium called dip-it fantasy film which is a type of resin paint. it dries into a lovely film in a wire frame. Her are some of the projects I have been working on. I will be working a lot more with this lovely medium but have only had it a week so far, so haven't had much chance to play. And finally, I have been asked by a friend to run a stall at a charity fundraiser in my local area tomorrow (26th april), to raise funds for 'Harlee's Wings' a charity dedicated to the memory of a very special little boy who was born (and sadly passed away) this January from a congenital heart defect. His parents have set up the charity to raise awareness and funds for sufferers of this defect, and their parents. I have made a prize for the raffle they are running, and here it is. 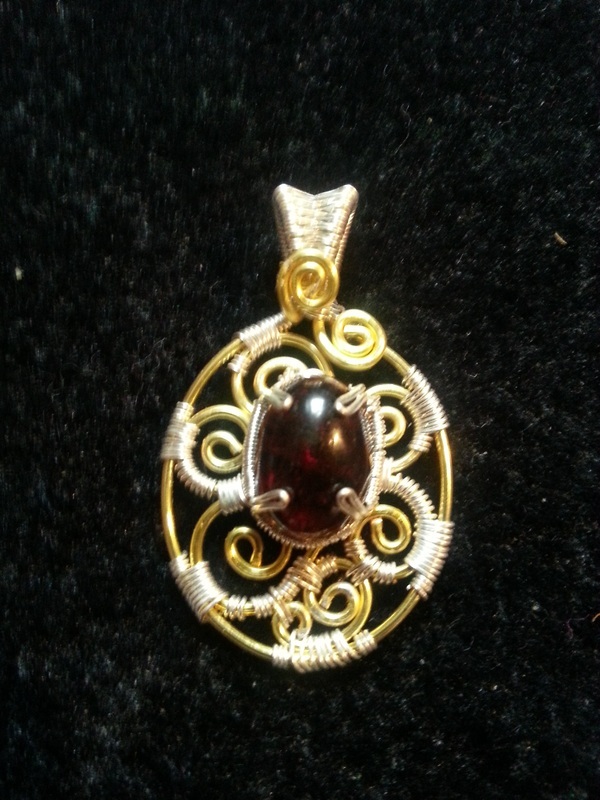 Made with a 14x10mm Almandine Garnet cab with gold and silver plated wires in 1mm, 0.6mm and 0.4mm. Hopefully at least. 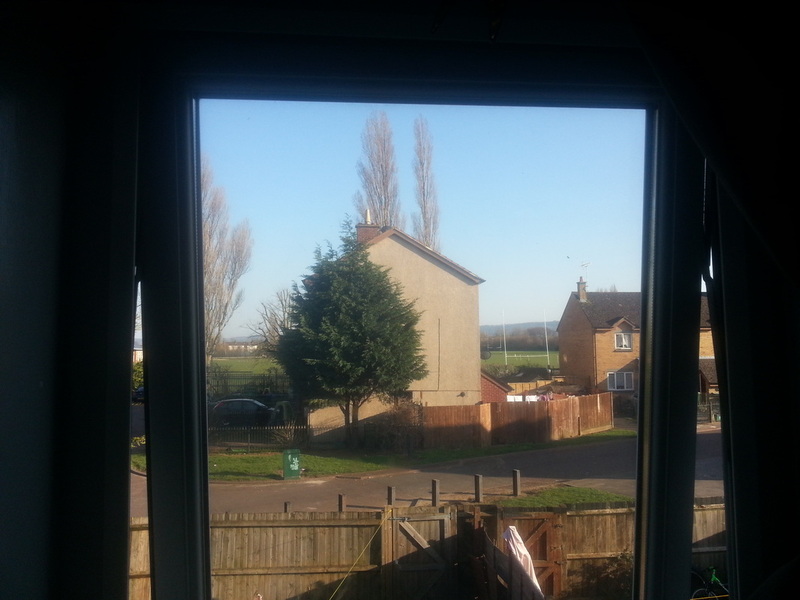 The weather is currently glorious, there is washing on the line, I have all the windows open and its warm. I have been fiddling about with lots of different things this last month, but first and foremost I have some birthday wishes to give. 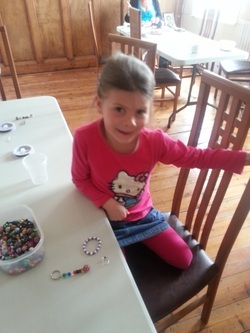 To my youngest daughter Freya, who will be 8 on wednesday (12th), a very happy birthday my little love. To my eldest daughter Hope who will be 9 the following saturday (21st), happy birthday to my big string bean, and to my eldest son Callum, who will be 15 (i know) on the 31st, and in france with school on his birthday, a very happy birthday, enjoy your school trip, and bring me back something nice. And of course a hearty hello to my youngest son Connor, who is 12 and doesn't have a birthday this month. but I didn't want him to feel left out as he is the only one who has to wait. 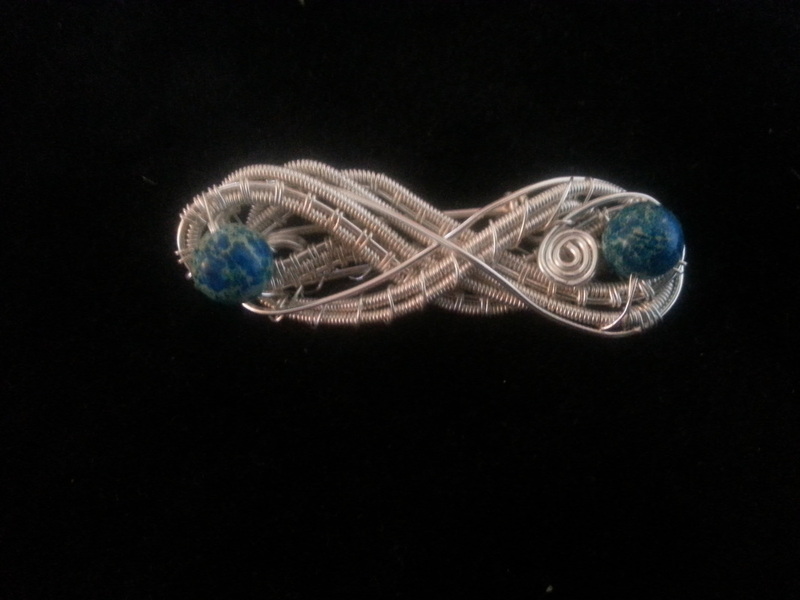 A variation on a Nicole Hanna tutorial, made with silver plated wire and blue imperial Jasper. 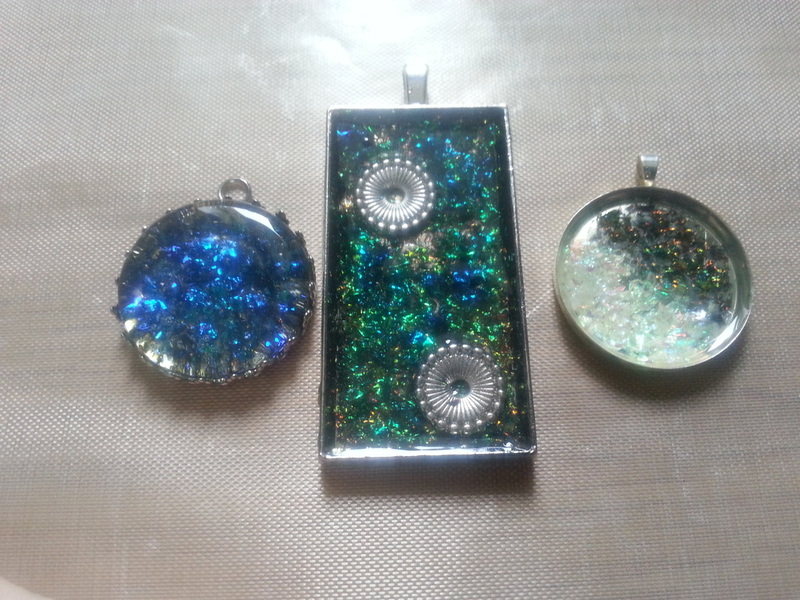 Experiments with clear jewel enamel and stellar and galaxy flash. Cornish Serpentine. 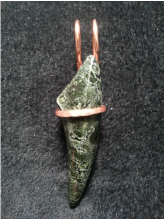 found in Cornwall, cut and polished in Bristol and wrapped by me with thick copper wire. 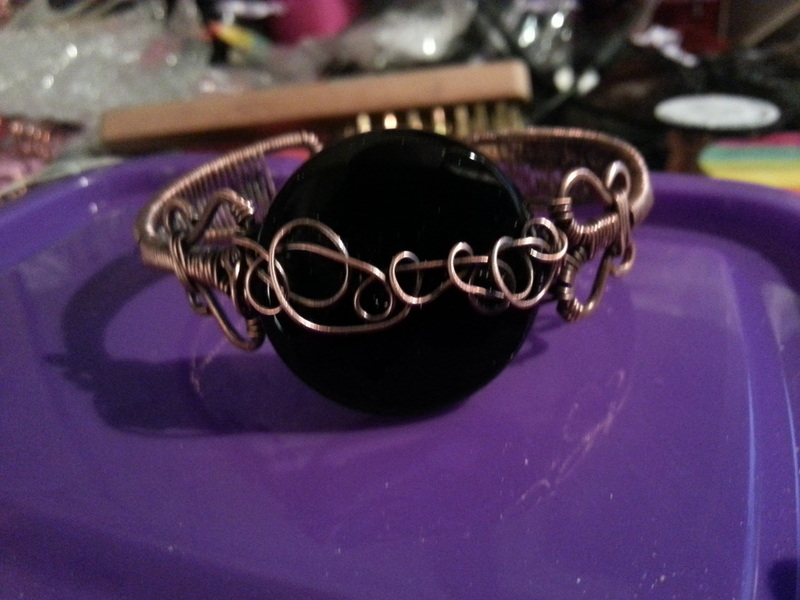 Wire work and black Agate bangle, been experimenting with adding patina. 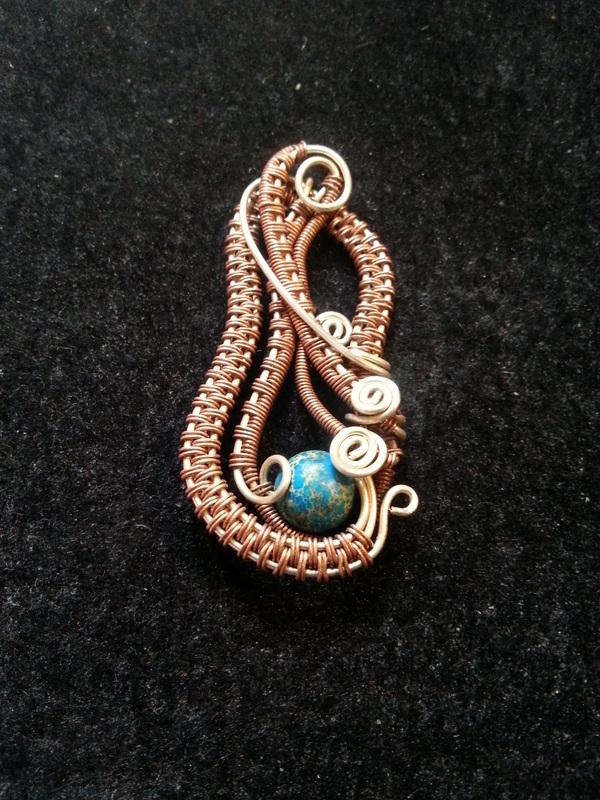 Another variation on a Nicole Hanna tutorial, with blue imperial Jasper, copper and silver plate. I cant believe its been over a month since i last posted. Times have been very busy, with courses, and meetings etc, as well as ill children, a partner off work and on crutches, and the horrible weather we have been having. It just doesnt inspire me to do very much, but onwards and upwards as they say. 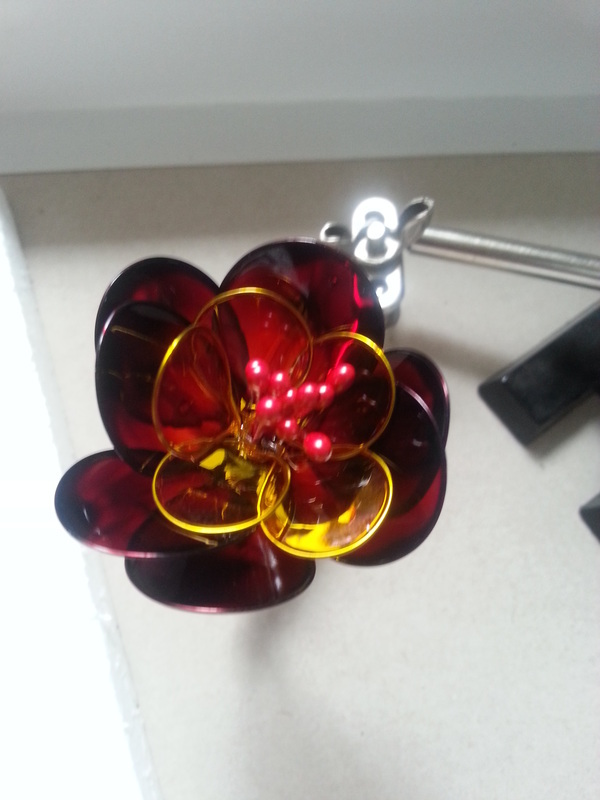 I have been creating, including a competition entry, and some valentines inspired pieces. This is a competition entry for Nicole Hanna's latest 'finish it' competition. 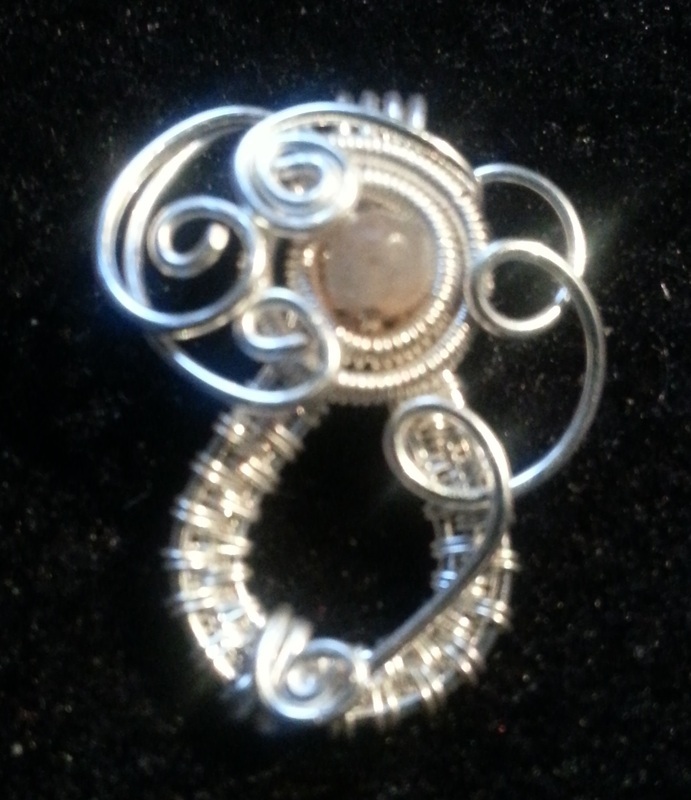 with silver plated wire and several sunstone beads. 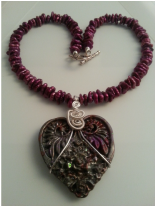 Valentines inspired piece with a jewel enamel heart, silver plated wire bail and deep red keshi pearls to compliment the colours in the heart. 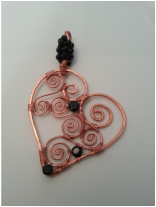 A valentines inspired copper and black spinel pendant, with thick hammered wire and filigree. 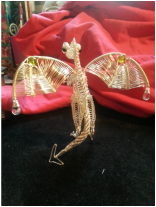 On monday (10th feb) I went to Redditch to take part in a course learning how to make viking knit dragons. The course was taught by the lovely Alison Tarry, and travelled there with my very good friend Michelle who was also doing the course. We learnt lots of wonderful new techniques, and polished some old ones. 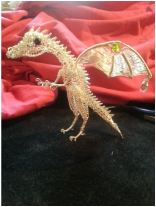 Although I didnt produce a whole dragon on the course, I made enough that I could bring it home to finish. 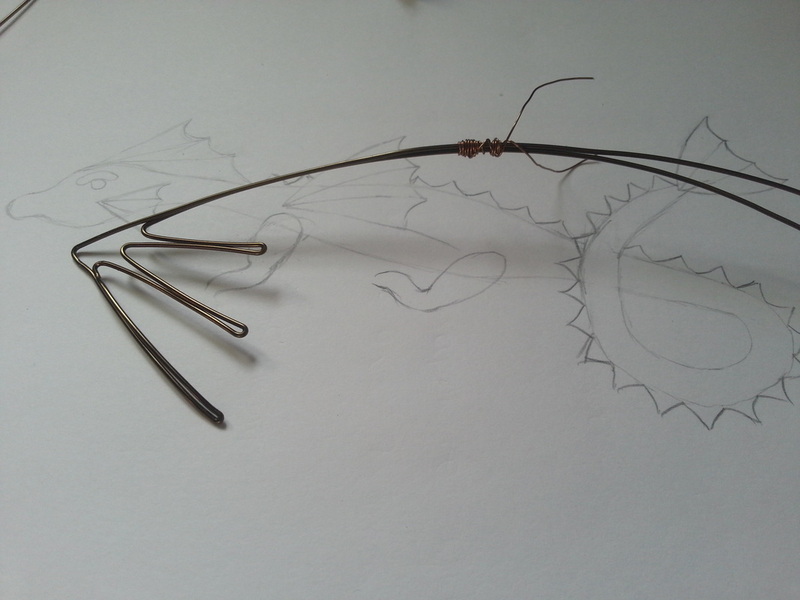 Following this, I have produced my first dragon, and am in the process of doing the second one. Below are the pics of the first, and the plans and progress of the second. 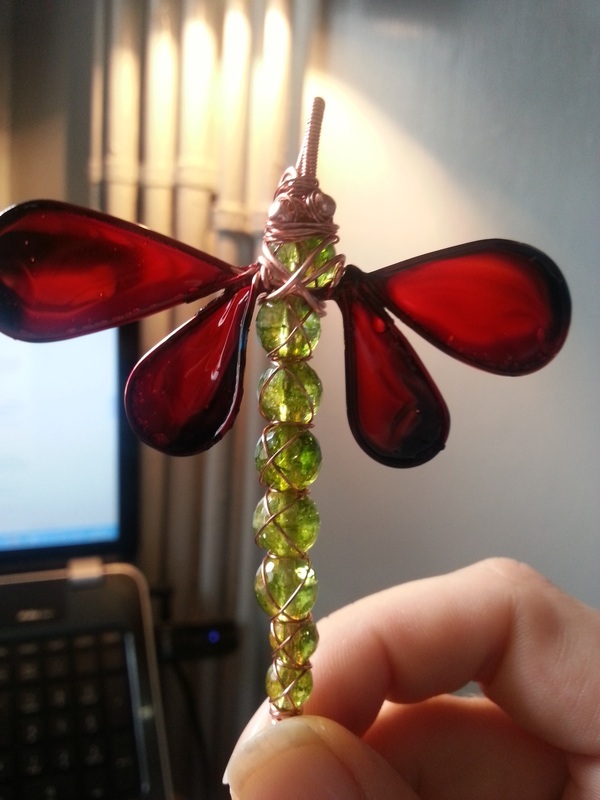 His name is Crackle, on account of the green crackled quartz in his wings. And black onyx for eyes. 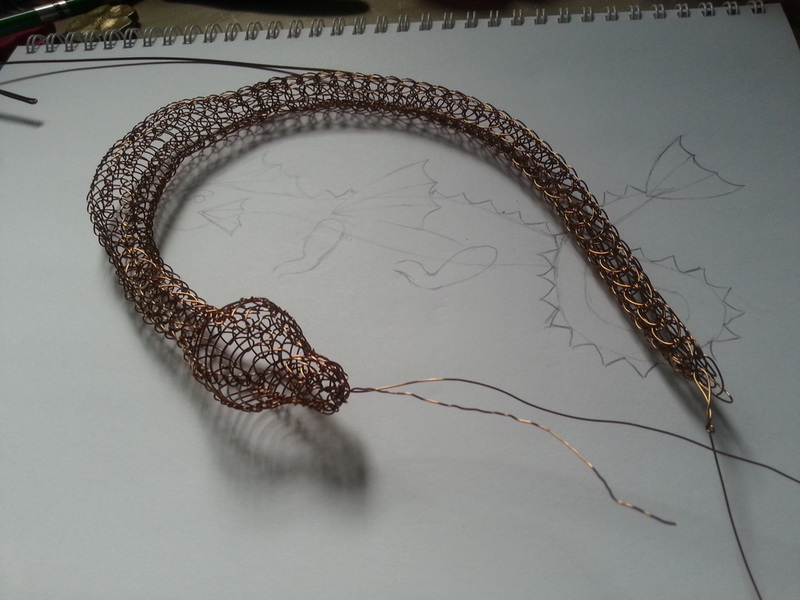 His body is complete, and looks a bit like a snake. 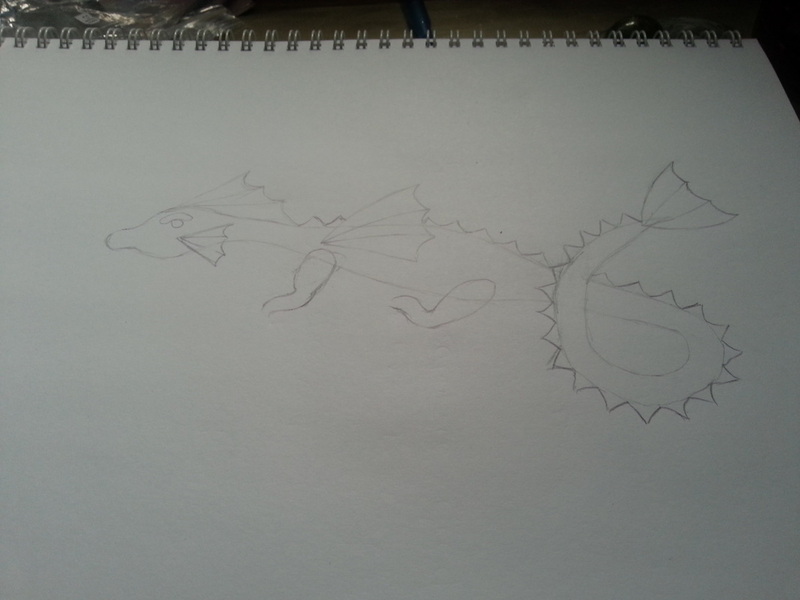 So far so good, He had wings, head frill and tail fan. 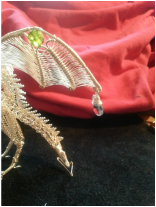 Pop the dragon is still a work in progress, He still needs facial frills, a spine with spikes and some legs, and will be lying down, curled around a rock of some description, possibly agate once I find the right one for him. I am continuing with the tiny theme at the moment. 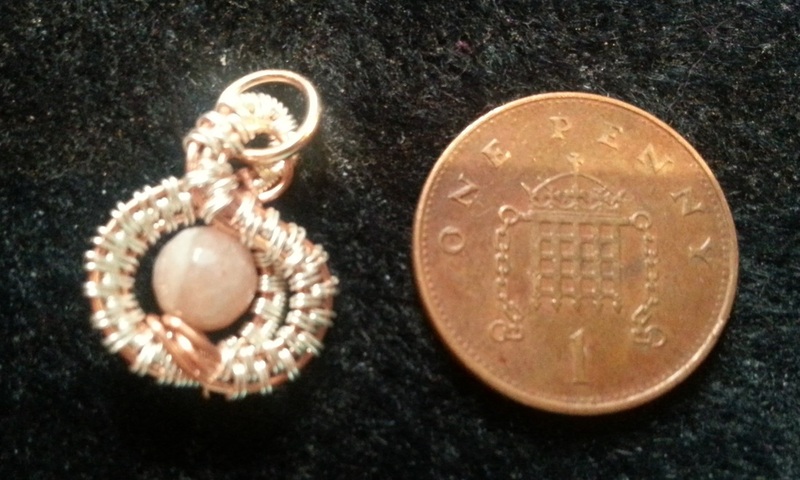 The top piece is the smallest piece of wirework I have ever done, and I have included a penny to show the size. 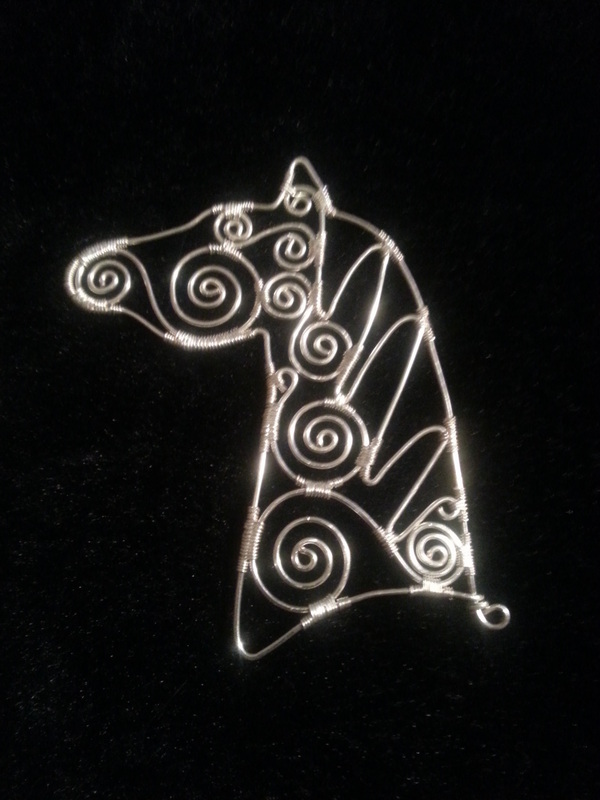 This was meant to be one of a pair of earrings, but I like it better as a pendant. At the top, the Layered Leaf pendant is only slightly bigger as shown in the next picture. 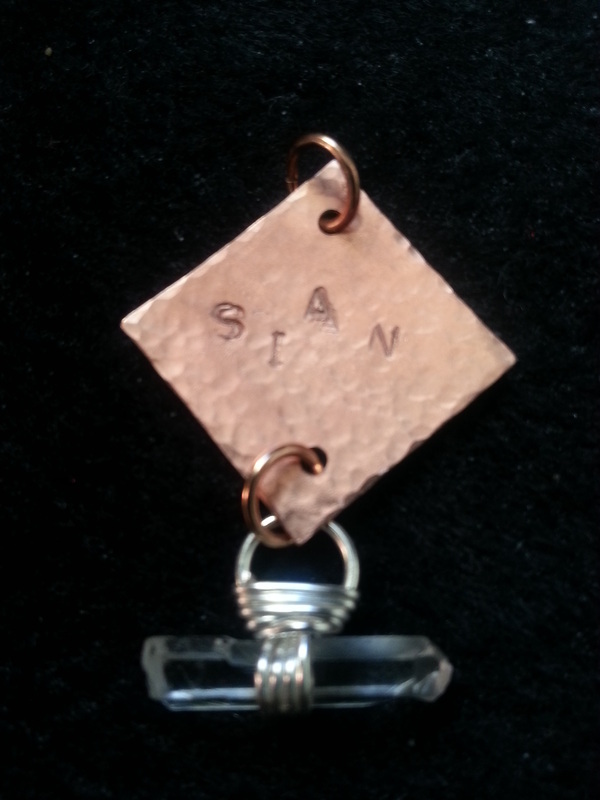 I used the other wrapped quartz for a pendant just for me. 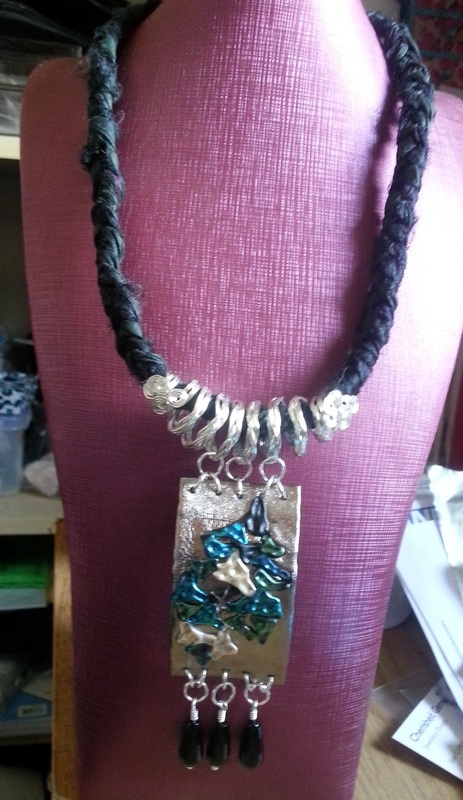 Showing the size of the Raindrop charm and the Layered Leaf pendant. 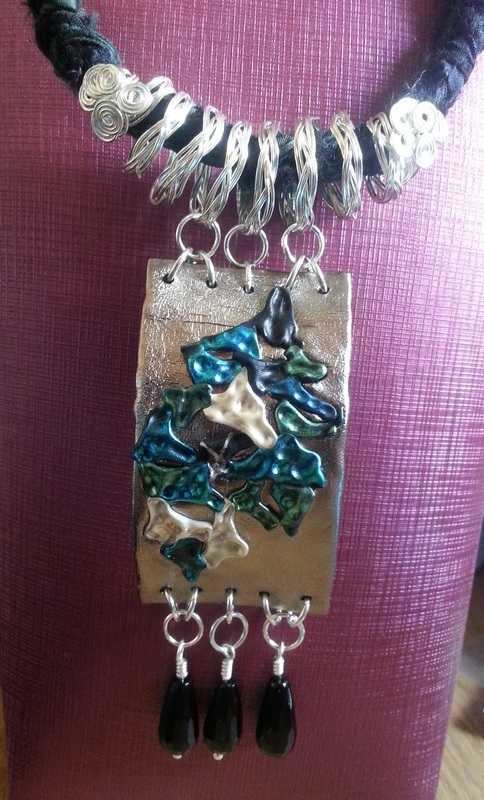 All the other pieces use elements and design from Nicole Hanna tutorials. This piece is inspired by her style, but all my own design. 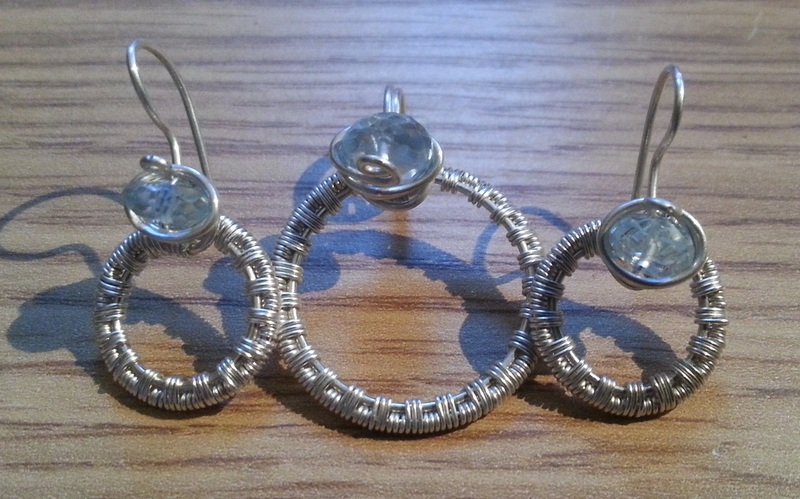 I have entered a Year of Jewellery project 2014, which involves making a different piece of jewellery every week, to a set theme. We are on week two currently, and below are my submissions so far. The week one theme was 'Something new for me', so I started with a tiny pendant. simple and easy to make with Labradorite and silver filled wire, this is so different from my usual large and intricate designs. The week two theme is 'Its Golden', I have tried another new technique, making a chain maille bezel for this gorgeous labradorite (which has lots of golden schiller) using gold and silver plated jump rings, and mounted onto a gold plated chain. 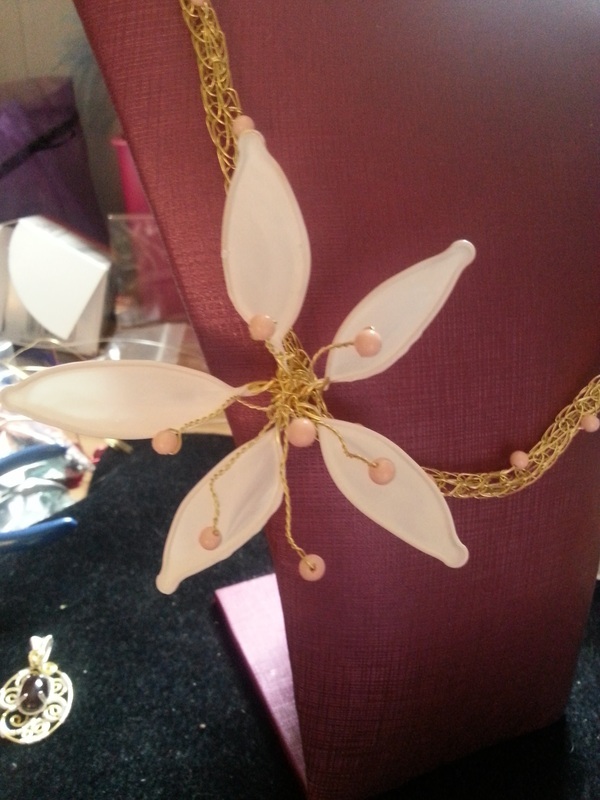 So, I will update with my Year of Jewellery pictures for each week. 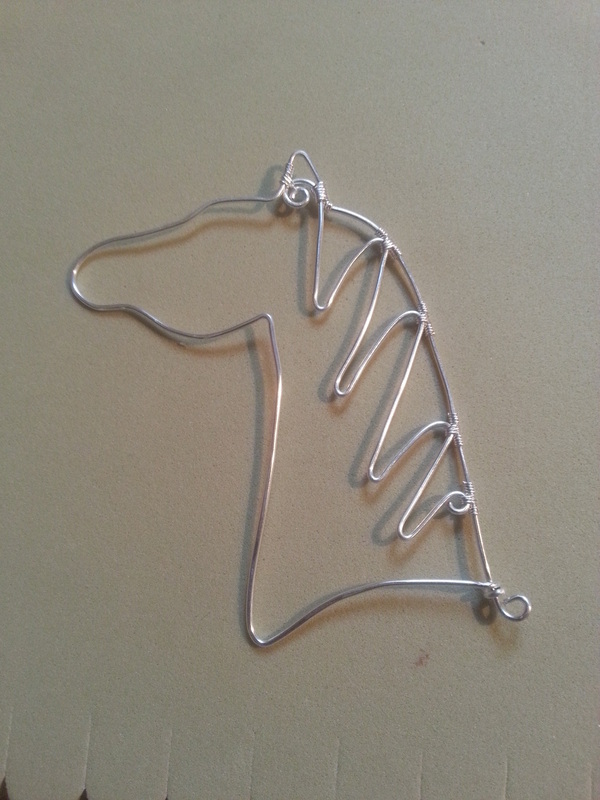 For now, I am back off to my desk to play with more wire. Well, that's Christmas and the New Year over and done with. I have had a lovely time, despite being ill with manflu over christmas. I had some lovely presents, and time with the family, and also did a lot of cooking. 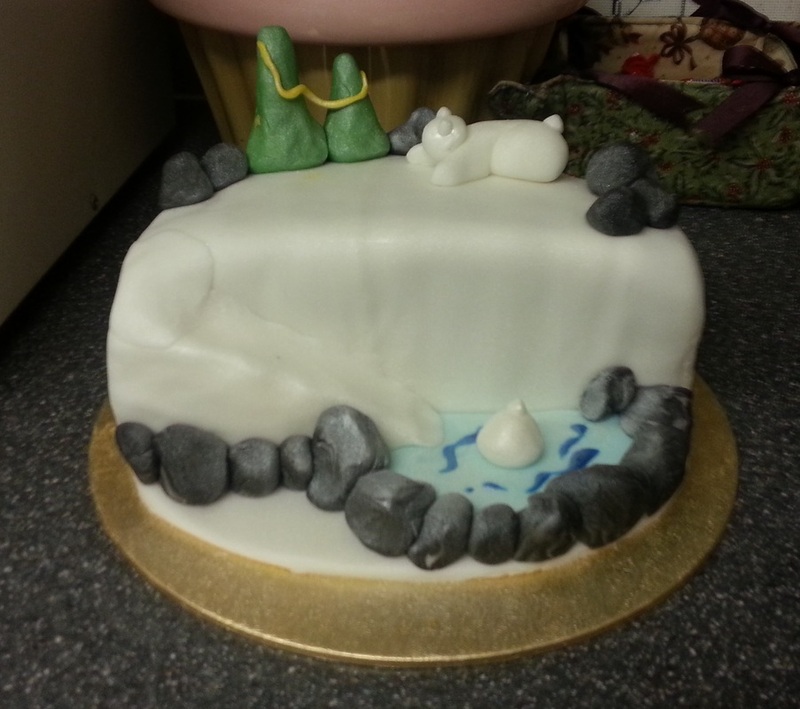 The half christmas cake which I decorated, my mum made the cake and split it between my sister and me to decorate. Coconut ice made with my 8 year old daughter. 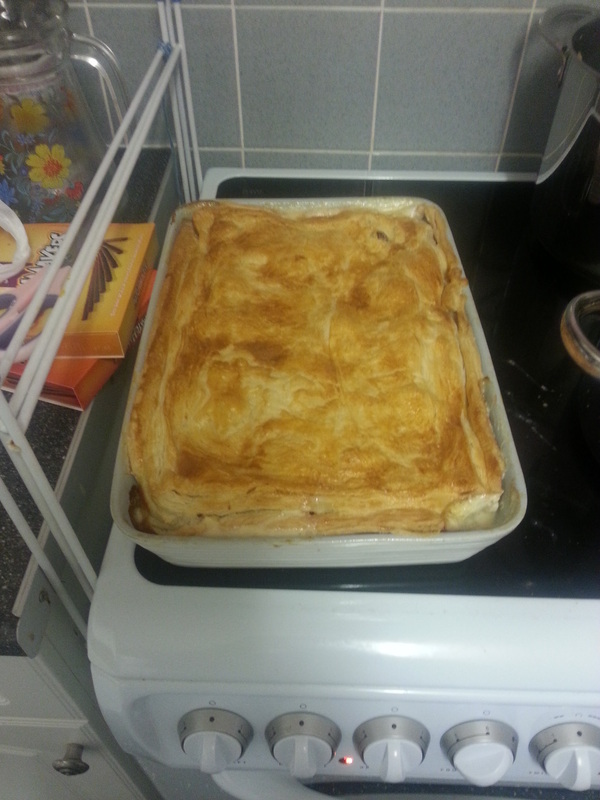 Turkey, Ham and Leek pie made on sunday 29th. 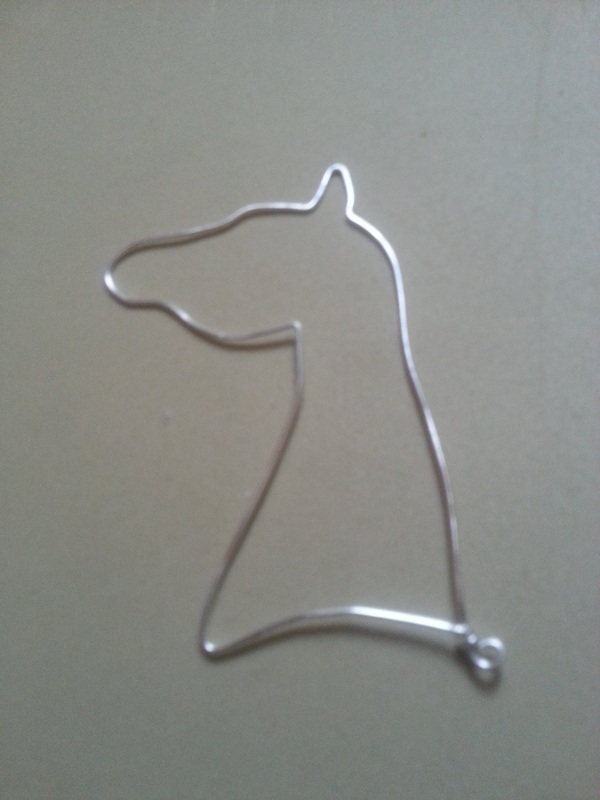 I have decided that my first project for 2014 will be to make small jewellery. 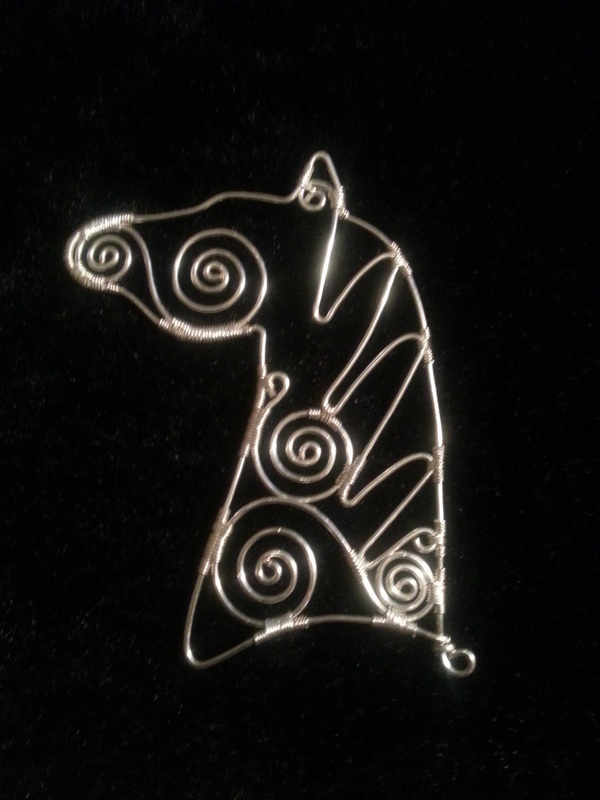 I normally make big pendants with a lot of detail, but am attempting to go for dinky for a while. 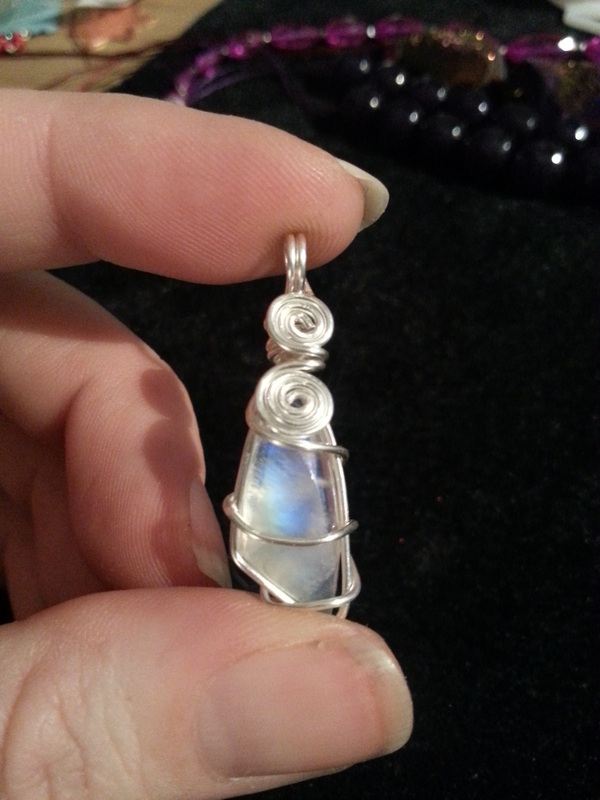 My last make of 2013, Rainbow Moonstone with silver filled wire. You can see how tiny it is. 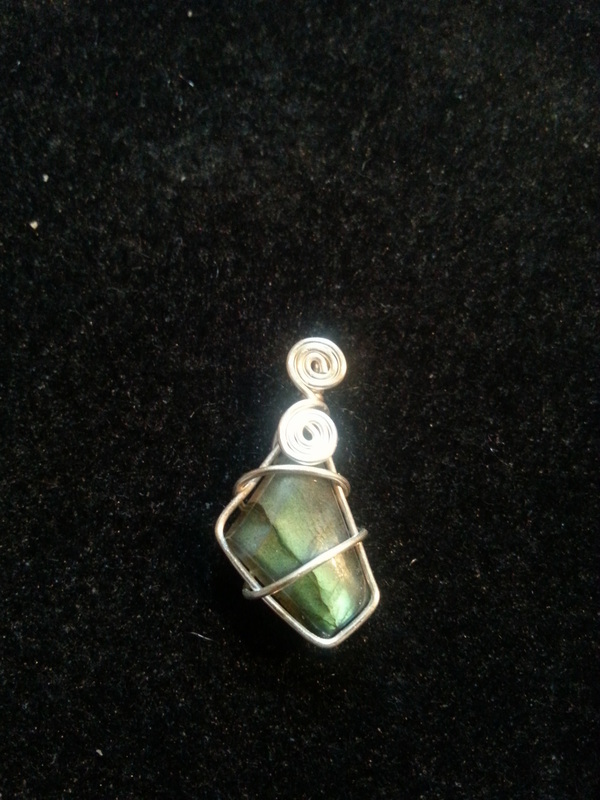 And my first make of 2014, Labradorite, again with silver filled wire. Just as tiny as the Moonstone piece. This is (I am told) a Romanov weave, with Byzantine links and Mookite gemstones. 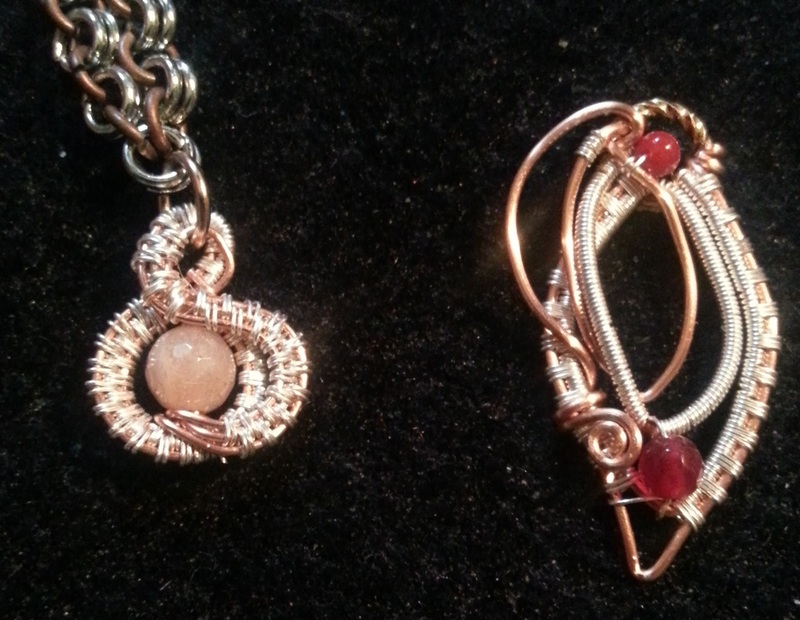 I have used gold plated nickel free jump rings, and gold and antique bronze wire for the handmade clasp. These are lovely, and I might keep them for myself. 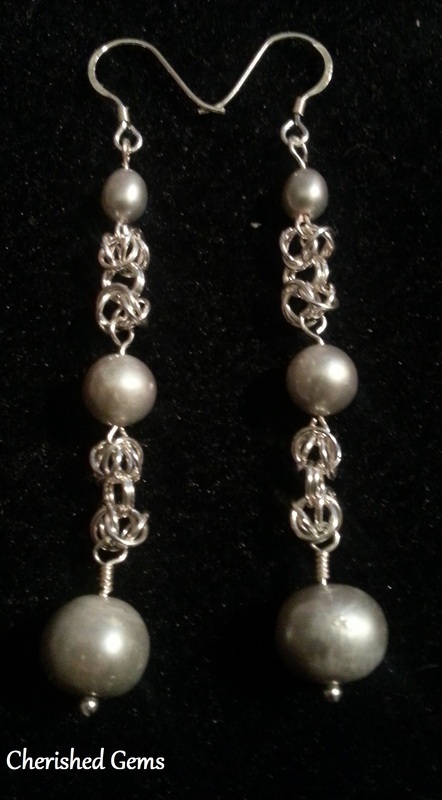 They are made with 5mm Sterling silver jump rings, with other Sterling silver, and silver cultured pearls. I adore them. 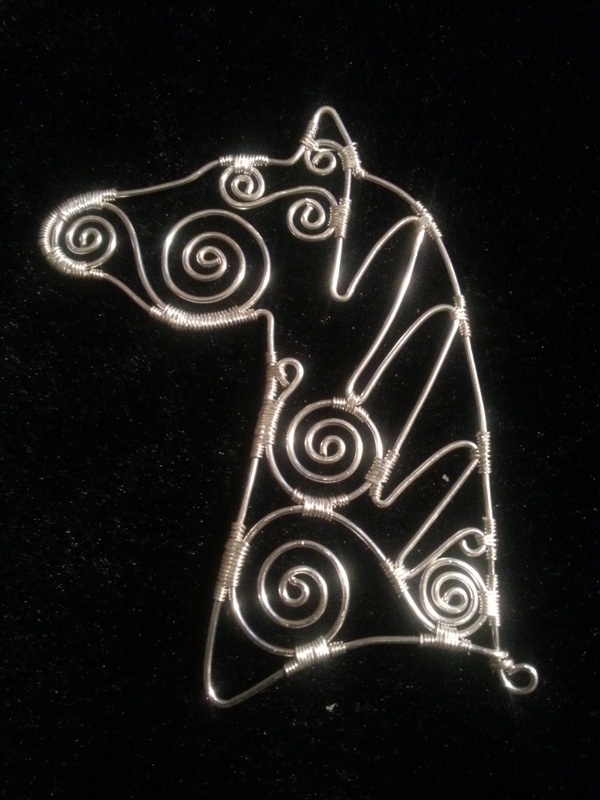 I have also been playing with wire and animal shapes, I have done a step by step set of photographs of one project with more to follow. 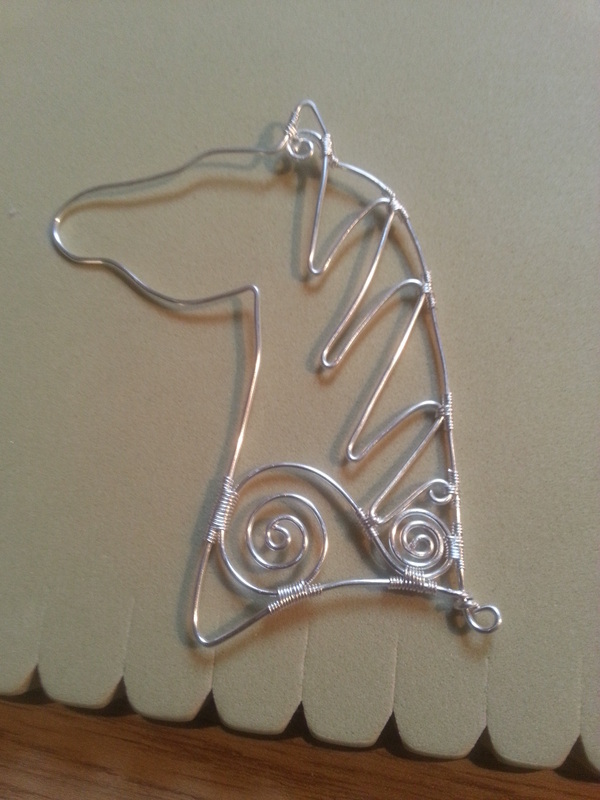 Step 1- Shape the wire frame into your animal shape, in this case, a horses head in 1mm wire. It will help to draw it first then shape around the picture with your fingers and tools. 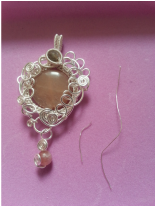 Step 4- Continue adding swirls, taking care to wrap all touching points neatly with 0.4mm wire. 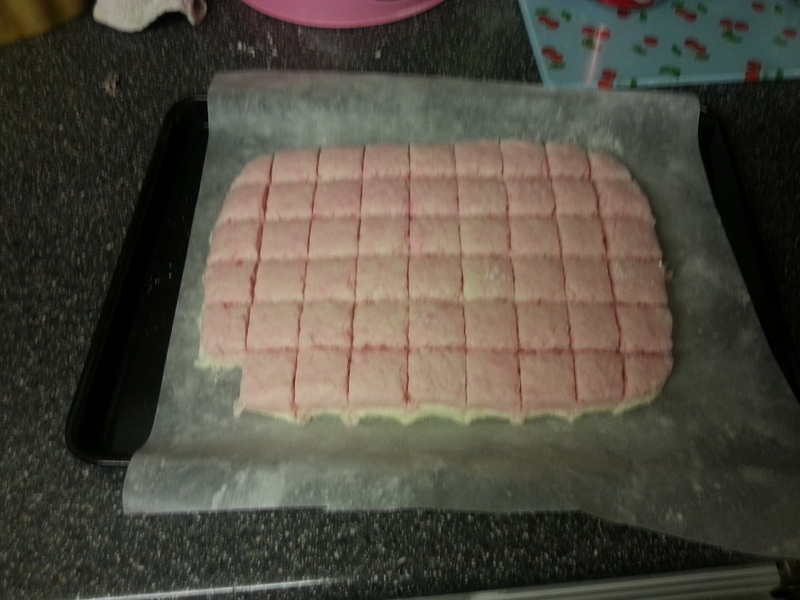 Step 7- You have finished adding swirls. put aside and make the bail. 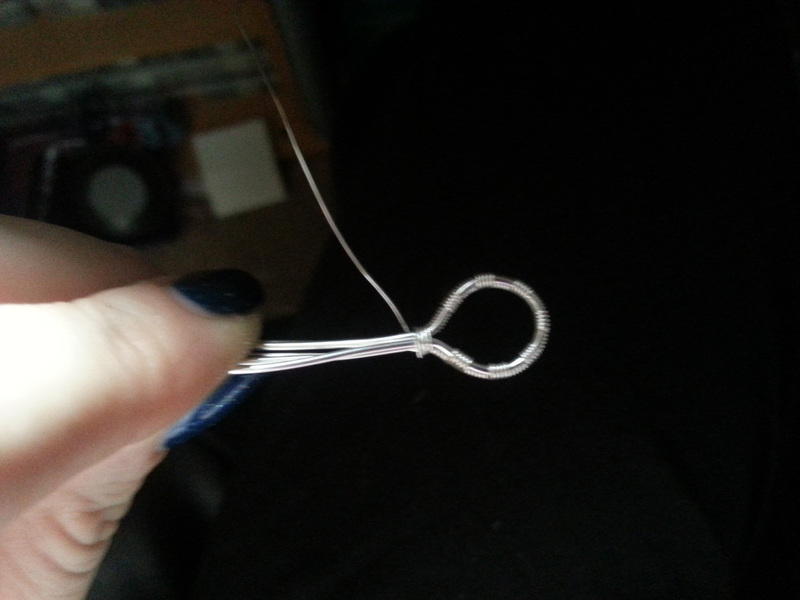 Step 9- Continue wrapping in this way, 6 times round the single wire then 5 times round both until you have about 1.5 inches of weave. 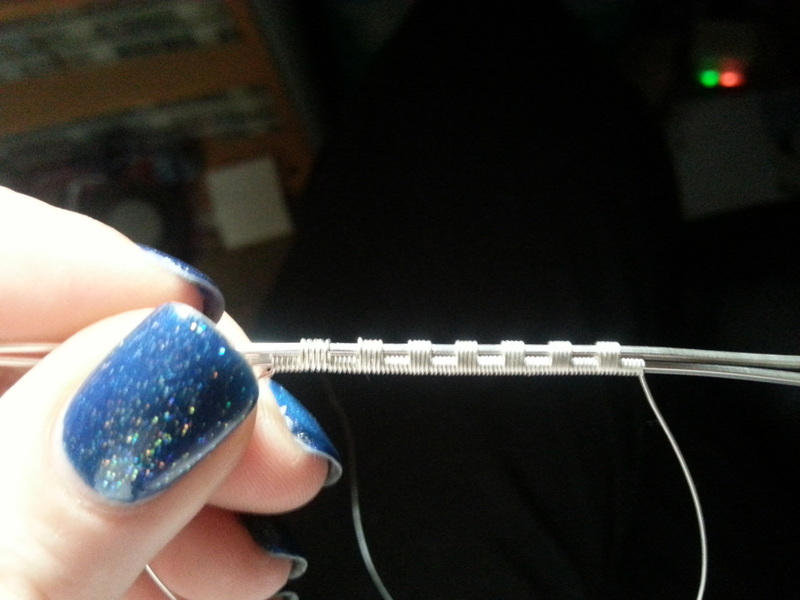 Step 5- Fill in the gaps with smaller swirls, all wrapped neatly at touching points with 0.4mm wire. 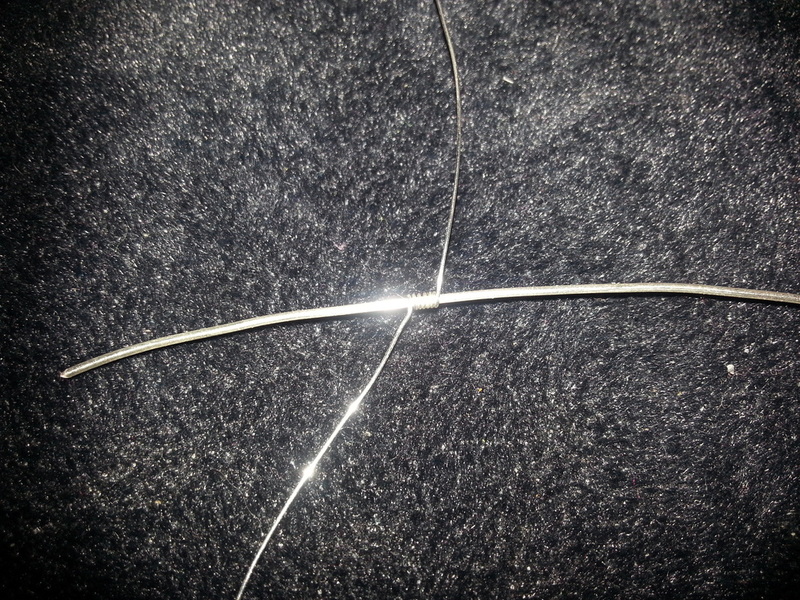 Step 8- Take 2 pieces of 1mm wire, about 10cm long. 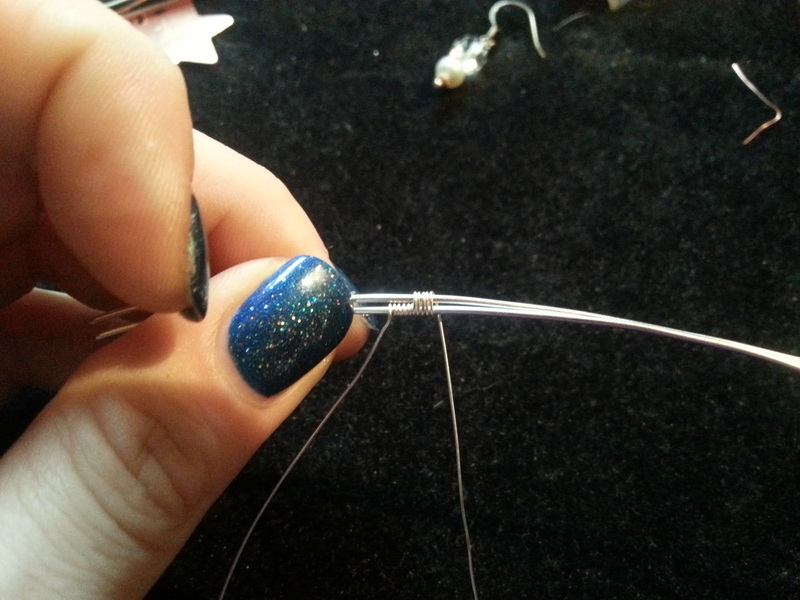 wrap one with 0.4mm wire 6 times around an inch along to anchor, leaving a tail of around 2 inches. Step 10- Bend the bail around a cylindrical object ie marker pen until you have a loop then wrap the wire around the bottom a few times to hold it. Kick out the unwrapped ends slightly so they point straight out from the loop. 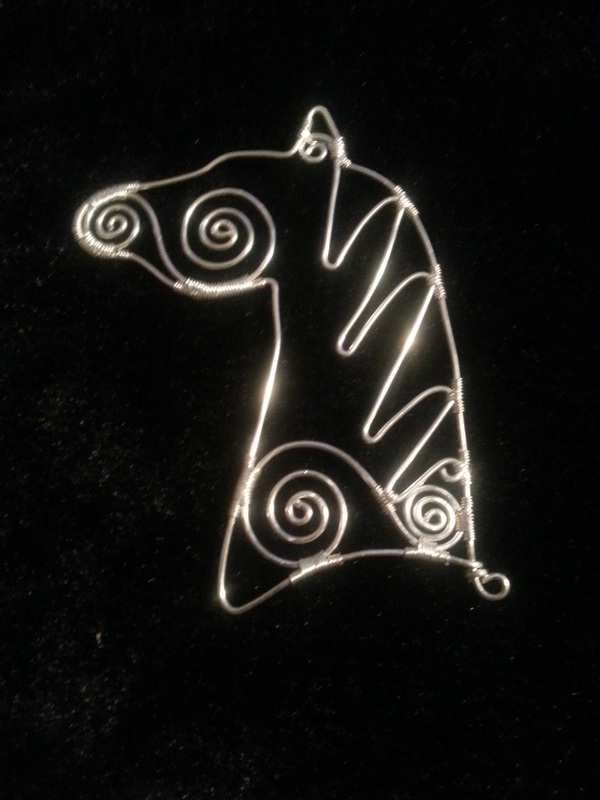 Step 3- Beginning to add in wire swirls. wrap them onto the frame with 0.4mm wire. Step 6- Adding in even smaller swirls to fill the gaps in. 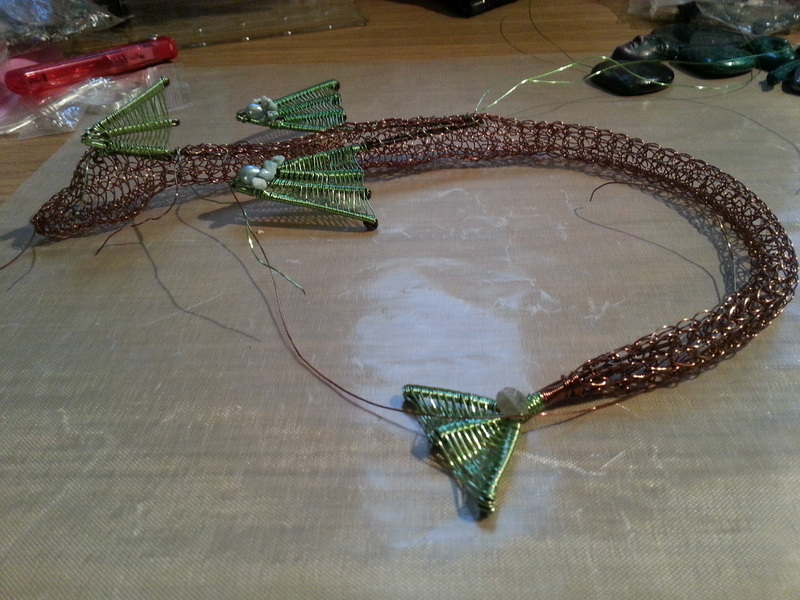 Step 9- Wrap the second wire on, wrapping 5 times around both wires. Make the wrapping as neat as you can. I like the effect that this weave gives, but you can weave any way you like. Step 11- Using the bail wires and the weaving wires wrap your bail onto the chosen point of your piece, in this case i have used the ear tip. 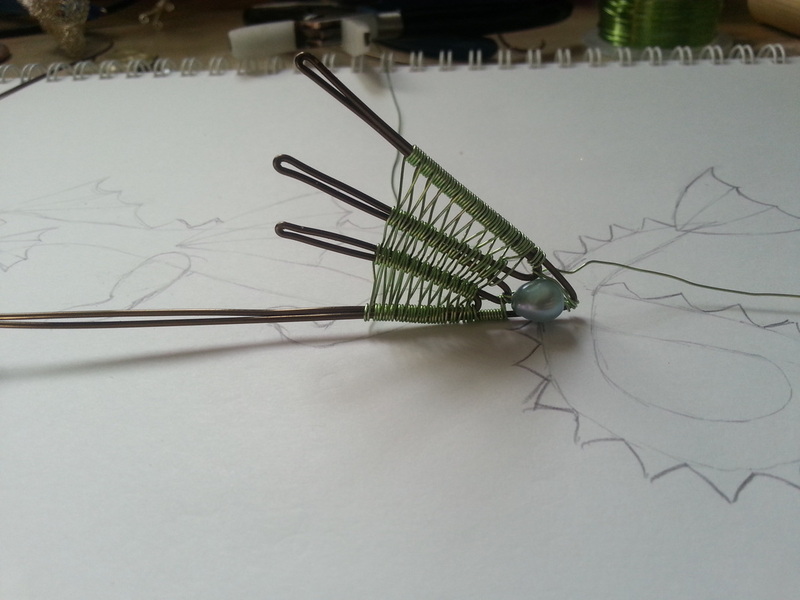 Using the long end of the weaving wire wrap small beads on to hide the attachment of the bail. I have used 4mm tigers eye beads. Trim and tuck in the ends and your piece is finished. 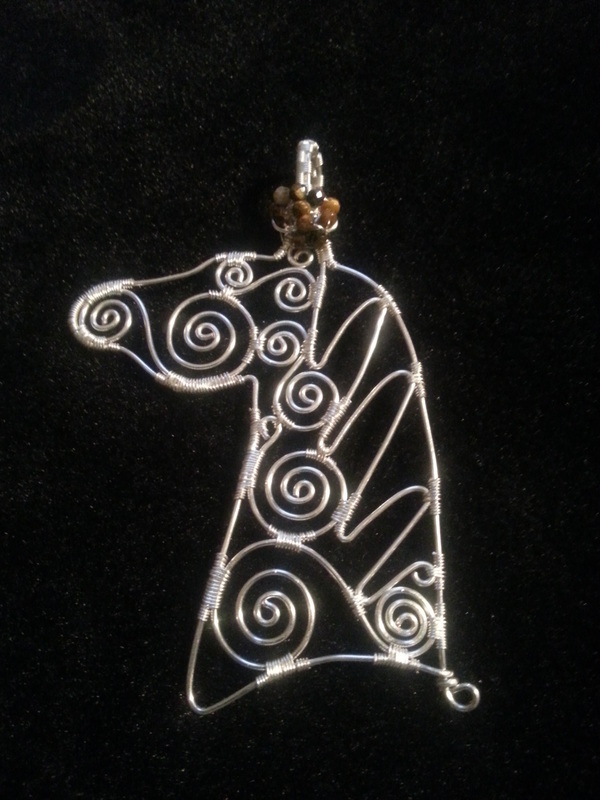 Larger picture of the finished horses head. 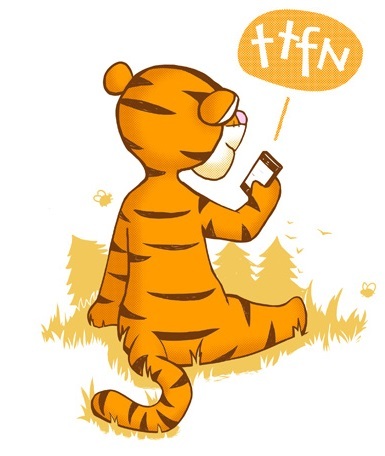 I love this and I have plans to do lots more animals, I am already working on a cat. 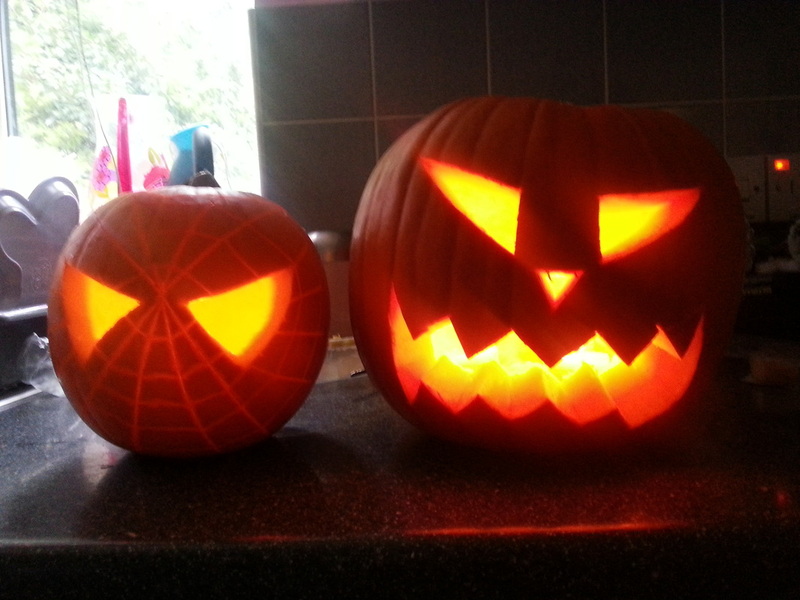 So, Halloween is over, my 12 year old son wanted a spiderman pumpkin (?) so i had fun carving that, and my own creation. 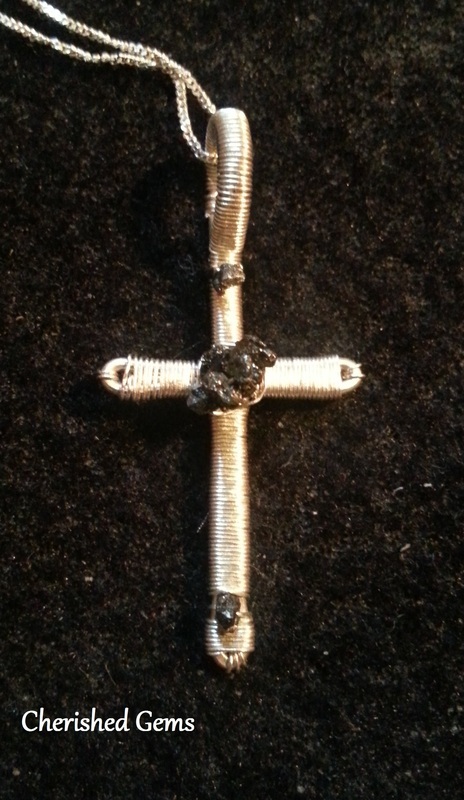 This is Sterling and Fine Silver with Genuine Black Diamond chips. 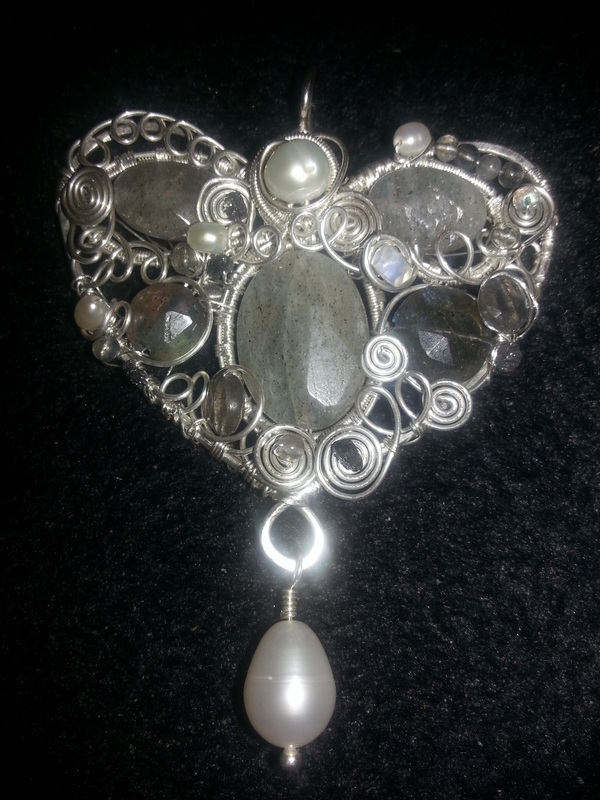 This is my most intricate piece yet, Sterling and Fine Silver wirework with gorgeous Labradorite, Rainbow Moonstone, Cultured Pearls and Genuine Black Diamond chips. 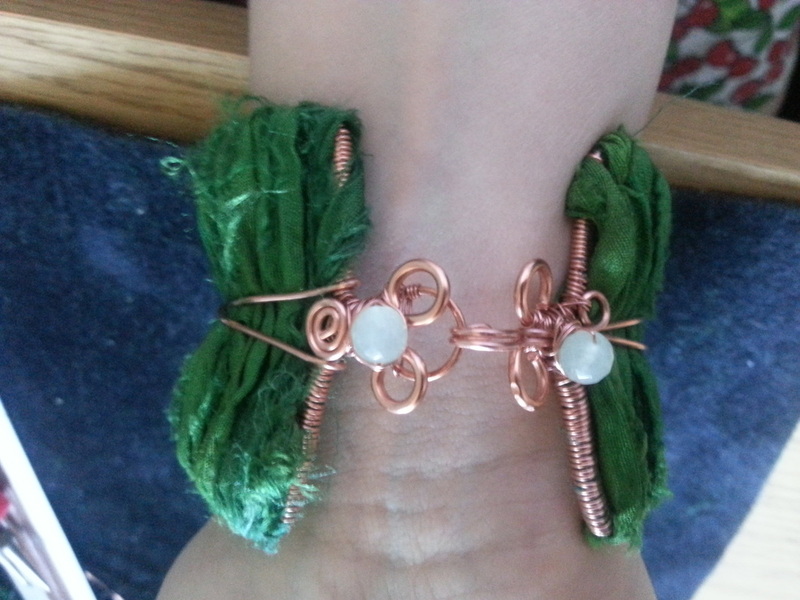 I am a mother of 4, and have been making jewellery now for about 4 years. 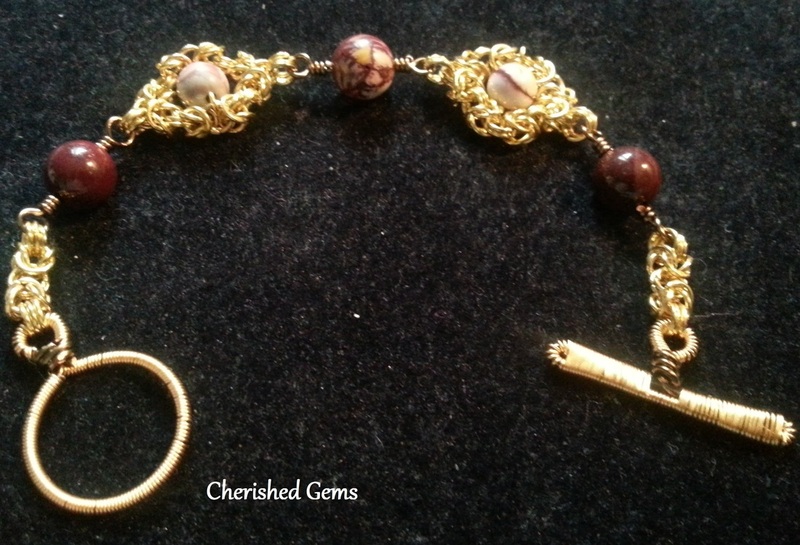 Cherished Gems was established in 2011.